Visit OKCMOA to check out our NEW Kehinde Wiley portrait, “Jacob de Graeff” and celebrate the reopening of our portrait gallery on the second floor. We are honored to announce that “Jacob de Graeff” is now part of the Museum’s permanent collection and will be on view beginning March 1! “Jacob de Graeff” is one of 11 new portraits commissioned for and currently on view within the Saint Louis Art Museum’s “Kehinde Wiley: Saint Louis” exhibition. The portrait features street-casted Brincel Kape’li Wiggins, Jr., and is modeled on 17th century Dutch artist Gerard ter Borch’s portrait of Jacob de Graeff. Wiley was the artist chosen by President Barack Obama to paint his official portrait after he left office. 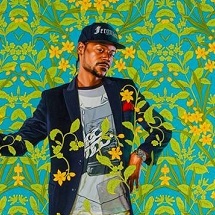 Wiley’s colorful, hyper-realistic and whimsical style made his portrait of the president a wild and celebrated departure from previous portraits. “Jacob de Graeff” will be on display on the second floor as part of the Museum’s exciting new presentation of its permanent collection. Wiley’s painting will anchor a new portrait gallery that also features works by Anthony van Dyck, Pierre-Auguste Renoir and George Bellows.